Thursday September 17th 6:40 – 8:40 p.m. 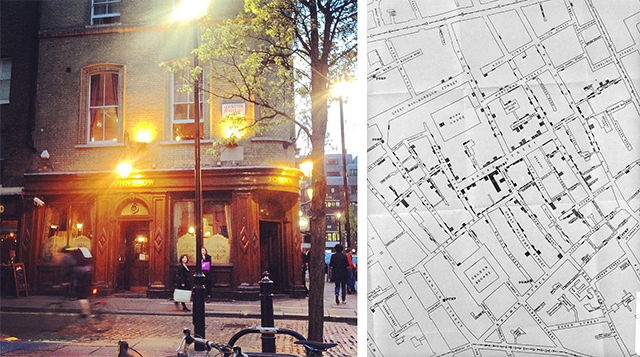 The John Snow Pub takes its name from Doctor John Snow whose famous “dot map” of 1854 plotted the deaths of scores of Soho cholera victims, tracing their activities to the stand pipe that gave them their drinking water. Snow famously snapped the handle off the stand pipe, and when the deaths stopped abruptly he proved that cholera was spread in water, and not as previously assumed, by miasma in the air. Meet outside the pub, ( 39 Broadwick Street W1F 9QJ) draw the vivid soho streets until 8:40 then meet up in the pub to look at sketches and raise a glass to John. All welcome, all free. Enjoy a lazy Sunday in Hyde Park. 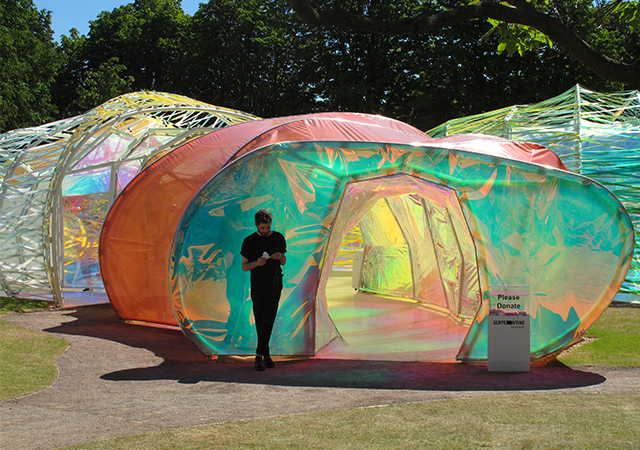 The Serpentine Summer Pavilion is a fantastic location for sketching people, interiors, light and shade, and abstract architectural forms, all in the great setting of Hyde Park. Enjoy the late strains of Summer among other sketchers -all welcome, all free. Draw until 2:30 then review the sketches. Retire for refreshments. 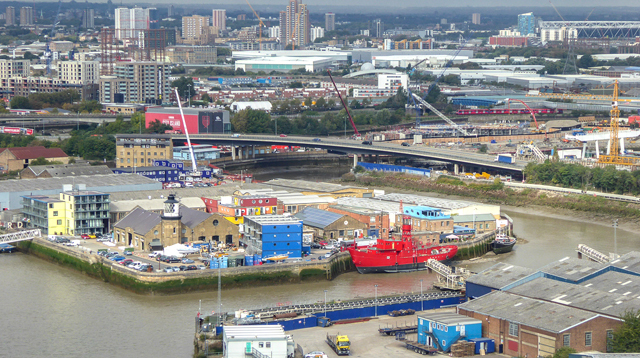 Our return to Trinity Buoy Wharf offers the rare opportunity to draw on the northern bank of the Thames. The fabulous views across the river towards Greenwich take in the Millenium Dome, the City and Canary Wharf. The vibe at Trinity Buoy creeps up slowly on you the more you draw – the layered histories of the Michael Faraday workshop – birthplace of the electric motor – remain here above the Chain and Buoy store, alongside London’s only lighthouse. There is no better place to practice perspective drawing than Container City – the studio and office complex designed from re-cycled shipping containers, and the new Clipper House, recycled form the 2012 Olympic Park Broadcasting Studios. Eat in Fat Boy’s Diner – the authentic chromium coach diner serving 1940s American classic food -Come and enjoy some time where merchant and naval seamen, dockers and doxies, pirates, privateers and all manner of salty seadogs have walked and worked before us. The grace and the grit of Little Venice, stamping ground of Joan Collins, Alan Turing, Obi-Wan Kenobi (actor Alec Guinness) & Joe Strummer before us. 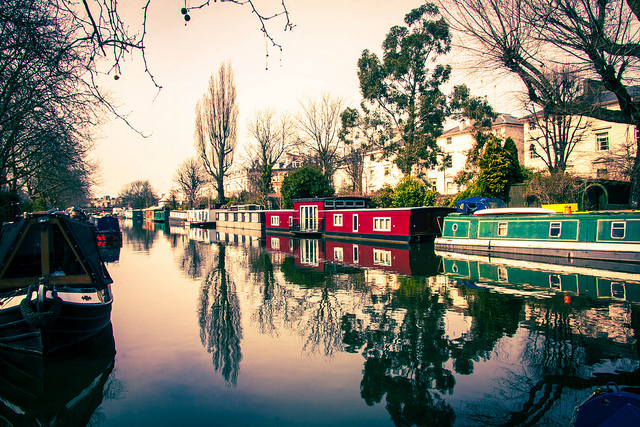 ……the Victorian elegance of the houses along the Regent’s Canal, the Westway passing from Notting Hill on its way into West End, the picturesque canal boats and characters in the heart of Paddington basin. Cafes and bars line the way. They have outdoor seats so you can drink, and draw, and be bohemian. Perfect Sunday material. Wander along the fabulous nocturnal river and you are in sight of the icons of London: Parliament; The London Eye; Waterloo Bridge; The National Film Theatre. 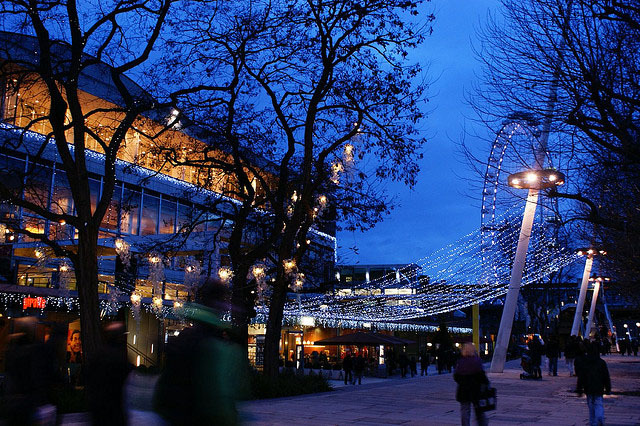 The Festival Hall has a plethora of free treats – there is a large and interesting bar, (free) river and Embankment views from the 2nd floor bar and balconies. And in bad weather there are loads of restaurants and bars, skateboarders under the concrete bunkers, and all those St. Patrick’s Day revelers – drunk as skunks – making a spectacle of themselves. 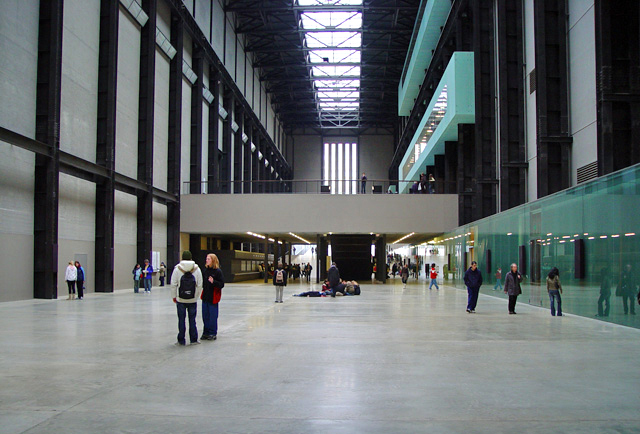 18.50 Meet in Turbine Hall draw in the galleries. Friday late at Britain’s national gallery of international modern art. 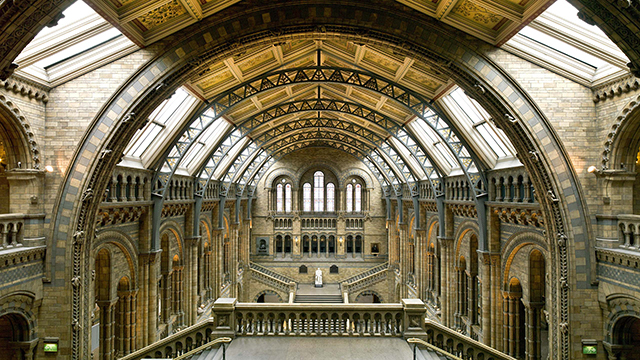 Set within Giles Gilbert Scott’s original Bankside Power Station; experience the scale and spectacle of the old building’s transformation into the most-visited modern art gallery in the world. Sketch the fantastic nocturnal views of St Paul’s Cathedral, inspirational interiors and unsuspecting visitors. No previous experience needed. 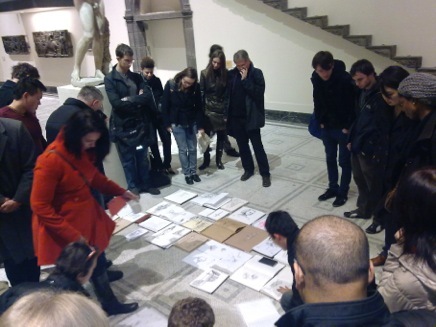 Our seasonal end of year drawing session at the worlds greatest design museum. Meet between 6:30 – 6:45 at the right of the main reception desk, main entrance, Cromwell Road. Have a sketchbook in your hand so we know you are with us. Ian Wale will be leading the session. Drawing review at 8:45 then on for a quick drink at the Bunch of Grapes pub, 207 Cromwell Road. Bring mates; all welcome, all free. Next year’s complete SKETCHMOB calendar will be on the web-site from the second week of January. 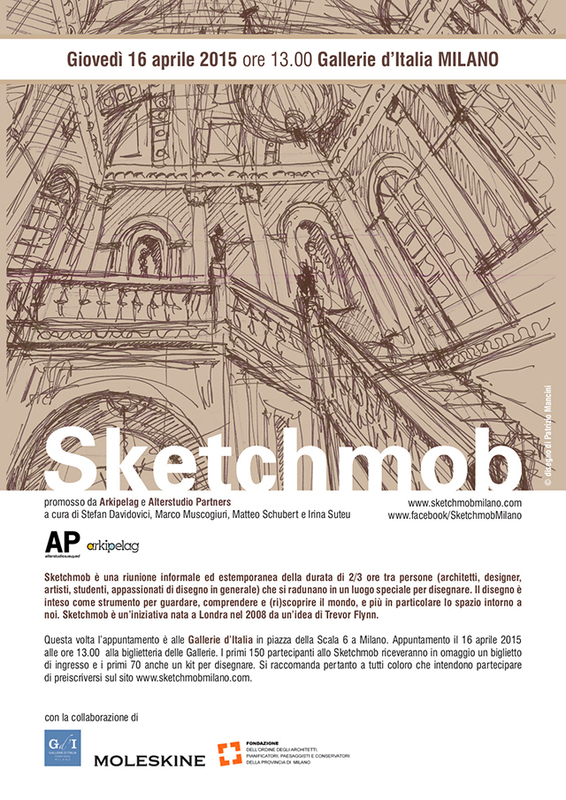 The next Milanese Sketchmob will actually be in Venice! For whoever wants to visit the Architecture Biennale and mingle with actual Venetian architects too. 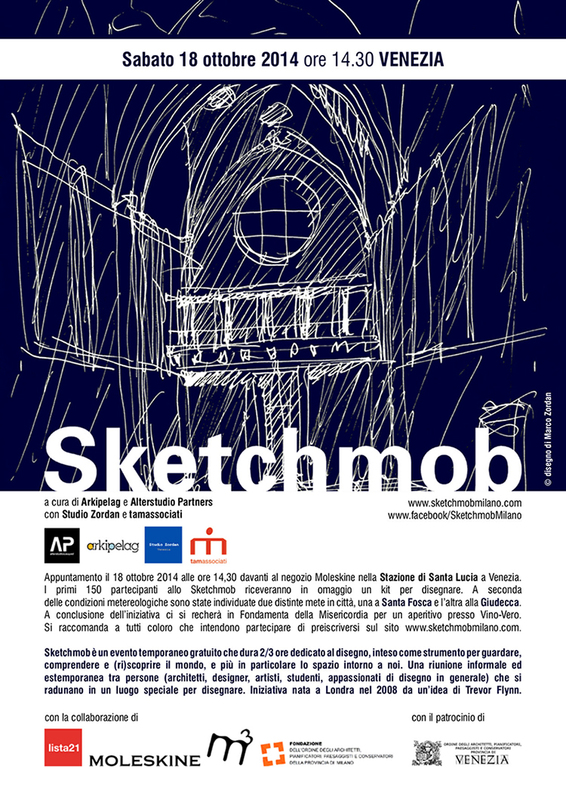 We will meet Saturday 18 october 2014 at 2.30PM in front of the Moleskine store in Venice’s Santa Lucia railway station. The first 150 participants will receive a free drawing kit.. Depending on the weather, we will go to the Santa Fosca or Giudecca. We will also get an aperitivo at Vino-Vero in Fondamenta della Misericordia.